With February being such a short month Foodie Pen Pal box didn't arrive until March but it is here now. This is my third foodie pen pal box and all of them have contained paprika, it must be a popular swap item but this one from Schwartz is a little different, it's a liquid spice mix that you add to chicken. I have plans for this in a turkey burrito tonight, I'll let you know how it goes. Trevor is back in triathlon training and I mentioned to Julie (my foodie pen pal) that I was interested in finding some good foods to go with his training plan which is where the sardines come into play. 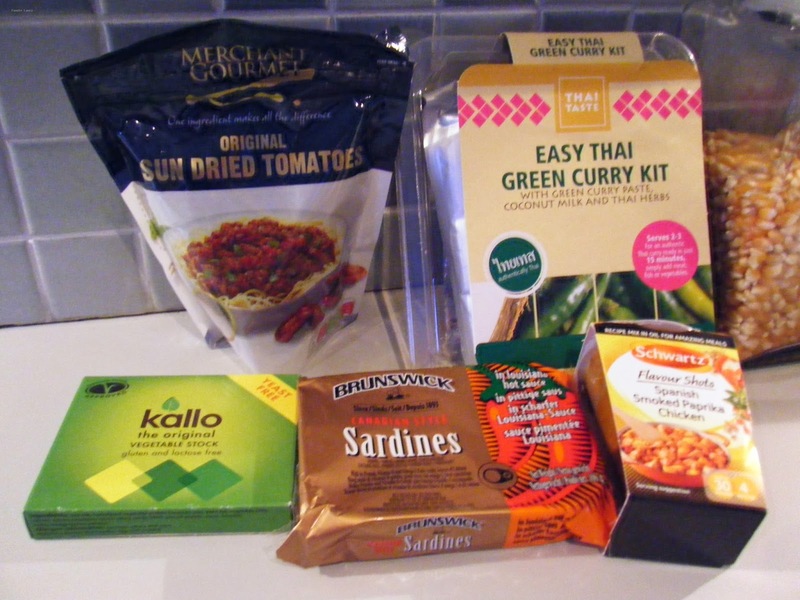 I think the thai curry kit will be handy to have in the cupboard for emergencies and you can never have too many sundried tomatoes. I was also intrigued by the gluten free stock cubes, most stock cubes have a thickening agent in them which is often wheat based. In our first supper club we had some gluten intolerant diners and it was only when I started the research for their needs that I discovered how difficult going gluten free can be. I'm looking forward to trying these out. The swap for this month is already under way but if you'd like to join us in April you can find all the details at Rock Salt.